Michael Boyer Delaware Valley Regional Planning Comm. Call to Order: Chairman Jacob called the meeting to order at 7:05 p.m. Presentation: Michael Boyer from the Delaware Valley Regional Planning Commission presented Connections 2040 for the Philadelphia Region. He is manager of the Office of Long Range Planning and Economic Coordination, which uses 2040 as their horizon year. The Commission is a metropolitan planning agency covering Philadelphia, the 5-county surrounding area and 4 counties in New Jersey. They serve 5.6 million people. A population of 6.2 million is predicted by 2040. Transportation is an important part of any plan, but fiscal constraints are a reality. Land use, conservation of natural resources and economic development are key factors. Their web site is www.dvrpc.org/connections2040. The Connections 2040 Program focuses on trends, vision and implementation. Development in the service area has been five times population growth. Projections are based on current trends. The population is showing an exodus from the center of the region. Trends: 1) In the 2010 Census, Philadelphia gained population for the first time since the 1950s. 2) Millenials prefer city and urban environments. 3) The elderly are a growing percentage. 4) Technology will drive changes: autonomous cars, etc. Our transportation system was built to take people into the city, but commuting patterns have changed. Sprawl-based development has a negative impact on land use, environment, transportation and the economy. The Connections 2040 program is intended to manage growth and protect the environment and open space while creating livable communities. It will be essential to take a more global economic view, prioritize education, reduce energy demand and establish a modern transportation system. System expansion including roads, public transit and turnpikes is crucial. Linking land use and transportation to key centers will promote growth. Projects have been achieved; SEPTA replaced vehicles from the 1950s and 1960s. However, bridges are in poor shape. 1/3 purchasing power was lost due to a failure to increase the gas tax. This has now been remedied through Act 89. It will increase Liquid Fuels allocations by 60%, which should in turn provide more local funding. The state will be able to provide 100% local matches for bridge building projects. For the near future, the majority of funding will go toward road and bridge repair rather than new construction. Delaware Valley Regional Planning Commission offers funding for small-scale road corridor projects and developing Comprehensive Plans. The Classic Towns Program allows funding for all communities by pooling monies. There is a circuit rider for a bikes/trails network. CMAC helps fund air quality projects and the Transportation Alternatives Program will open for applications in February with six to seven million dollars available for transportation enhancement. Brochures are available to help implementation of various programs. There is a municipal resources database to check for funding sources. Regional circuit riders are available for energy efficiency. Training programs and webinars are offered. There is money in the budget for studies. Recognition of Membership Contributions: Thanks were expressed to the Northern Federation’s By-Laws Committee comprised of Lisa Lacroix, Mariea Geho, Sara Shick, Bill Nesley, Stan Stubbe and Charles Jacob. Chris McNeil was recognized and thanked for helping to include former and current members in this evening’s presentation honoring Charles Jacob. A Certificate of Appreciation was presented to Mr. Jacob for over 18 years of continuous service, which has made him a recognized voice in conservation and regional planning. Lisa Lacroix was thanked for arranging the certificate and refreshments for tonight’s meeting. The following member townships were requested to provide the Northern Federation with names and email addresses for their representatives appointed for 2014: West Vincent, North Coventry, West Pikeland, Warwick and East Coventry. East Pikeland has already responded and South Coventry has withdrawn from membership. Additionally, townships were requested to indicate which member has voting privileges. By-Laws – Draft By-Laws were submitted to the member townships in November. The original Article III pertaining to planning codes was struck because it conflicted with the Pottstown Regional Planning Center’s group/COG requirements. The current By-Laws therefore do not reference Act 247. Member townships were polled whether to adopt the current By-Laws: North Coventry – yes; East Pikeland – yes; West Pikeland – yes; West Vincent – yes; Warwick – yes; East Coventry – yes. A motion was made by Stan Stubbe, seconded by Mariea Geho, to adopt the By-Laws as they now stand. All in favor. Nominations for Chairman – Motion made by Stan Stubbe, seconded by Stock Illoway, to appoint Charles Jacob interim chairman pending selection of a new chair. The By-Laws require that this person be a Township Supervisor. Member townships were polled: North Coventry – yes; East Pikeland – yes; West Pikeland – yes; West Vincent – yes; Warwick – yes; East Coventry – yes. All in favor. Nominations for Vice Chair – Motion made by Sara Shick, seconded by Stan Stubbe, to appoint Lisa Lacroix as Vice Chair for 2014. Member townships were polled: North Coventry – yes; East Pikeland – yes; West Pikeland – yes; West Vincent – yes; Warwick – yes; East Coventry – yes. All in favor. Nominations for Treasurer – Motion made by Lisa Lacroix, seconded by Stock Illoway, to appoint Stan Stubbe as Treasurer for 2014. Member townships were polled: North Coventry – yes; East Pikeland – yes; West Pikeland – yes; West Vincent – yes; Warwick – yes; East Coventry – yes. All in favor. Nominations for Secretary (paid position) – Motion made by Sara Shick, seconded by Stan Stubbe, to appoint Miriam Newman as Secretary for 2014. Member townships were polled: North Coventry – yes; East Pikeland – yes; West Pikeland – yes; West Vincent – yes; Warwick – yes; East Coventry – yes. All in favor. Location of 2014 Meetings – Motion by Stan Stubbe, seconded by Stock Illoway, to hold 2014 meetings at the Warwick Township Building. Member townships were polled: North Coventry – yes; East Pikeland – yes; West Pikeland – yes; West Vincent – yes; Warwick – yes, East Coventry – yes. All in favor. Date of 2014 Meetings: Motion by Stan Stubbe, seconded by Stock Illoway, to hold 2014 meetings on the second Tuesday of each month. Member townships were polled: North Coventry – yes; East Pikeland – yes; West Pikeland – yes; West Vincent – yes; Warwick – yes; East Coventry – yes. All in favor. Time of 2014 Meetings: Motion by Stan Stubbe, seconded by Stock Illoway, to hold 2014 meetings at 7:00 p.m. Member townships were polled: North Coventry – yes; East Pikeland – yes; West Pikeland – yes; West Vincent – yes; Warwick – yes; East Coventry – yes. All in favor. Dates, Time and Location to be advertised. Review of Minutes of 11/12/13: Motion to approve by Lisa Lacroix, seconded by Stan Stubbe. All in favor. Treasurer’s Report: Savings $8,056.35; Checking $771.37; Total $8,827.72. Motion by Sara Shick, seconded by Mariea Geho, to approve. All in favor. Discussion: An idea was put forward to request RSVPs to determine meeting attendance. This was superseded by agreement to attempt to schedule guest speakers further in advance and cancel meetings for which no speaker has been obtained. Membership dues for 2014 were waived. This is to be revisited in October, 2014 for the forthcoming year. The membership agreed the February 2014 meeting will be held for the purpose of discussing and approving a web site for the Northern Federation. South Coventry Township has withdrawn from membership in the Northern Federation. Motion to accept their letter of withdrawal by Sara Shick, seconded by Stock Illoway. 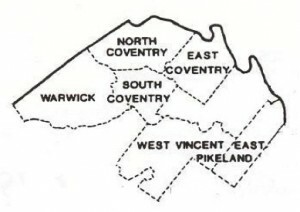 Membership townships were polled: North Coventry – yes; East Pikeland – yes; West Pikeland – yes; West Vincent – yes; Warwick – yes; East Coventry – yes. All in favor. By May, the Natural Lands Trust may have information on the outcome of their grant application to the William Penn Foundation. If it is approved, they will be our speaker for that month. On Wednesday, January 22, West Pikeland Township will host a meeting at 6:30 p.m. regarding pipeline development. This will be an important regional meeting including local and county officials as well as officials from pipeline companies. Adjournment: There being no further business, a motion was made by Stock Illoway, seconded by Lisa Lacroix, to adjourn at 8:55 p.m.
Next Meeting: Tuesday, February 11, 2014 at 7 p.m. at the Warwick Township building.